Lophogorgia cardinalis Bayer, 1961:201 fig 60; plate VII fig. 5. Remarks. The Florida specimen examined for this work is the only record of presence of this species in the SAB. The specimen is 46 mm in length and the branches are 1.5 mm in diameter. The branches are regularly pinnate in one plane, generally straight or with a slight curve. The calyces are moderately prominent, rounded and biserial, giving the branches a flattened appearance. Sclerites are in the form of slender, acute spindles, reaching almost 0.2 mm, and some blunt capstans reaching 0.1 mm. Anthocodial rods are present and are approximately the same size as the spindles. The rods are pink and the spindles and capstans pale orange. The colony color is bright red or orange. The examined specimen has acute spindles that are longer and more slender than Bayer’s (1961) description, in which he notes the variance in the spindles and anthocodial rods. The described spiculation of this species resembles that of L. punicea, so distinguishing the two species may be easier when comparing colony morphology rather than sclerites. Atlantic distribution: Gulf of Mexico, northern Florida to Cuba, 19-77 m (Bayer, 1961; NMNH collections). Figure 2. 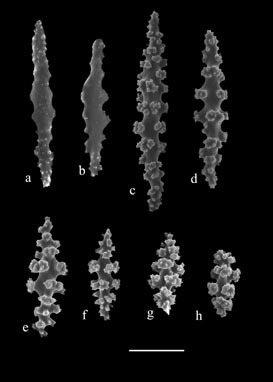 Sclerites of Leptogorgia cardinalis (USNM 72437); a,b) anthocodial rods; c,d) elongate spindles from coenenchyme; e-h) small spindles from coenenchyme. Scale-bar = 50 µm. Figure 1. 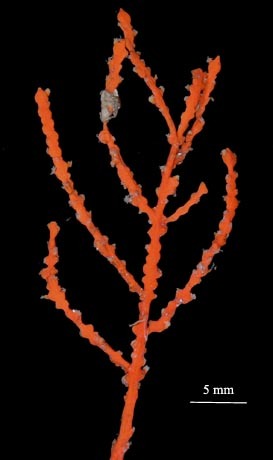 Leptogorgia cardinalis, preserved specimen (USNM 72437). Scale bar = 5mm.